Having great teeth is very important as your teeth are some of the first things people notice; they’re a sign of health as well as confidence. Teeth become discolored, turning yellow or even a beige or brown color, due to stains that develop on both the surface of teeth (the enamel) as well as deeper in the teeth’s structure. Tooth enamel is the hard, white surface of your teeth. The best way to whiten your teeth naturally, however not always the easiest, is to simply brush your teeth after eating or drinking something. 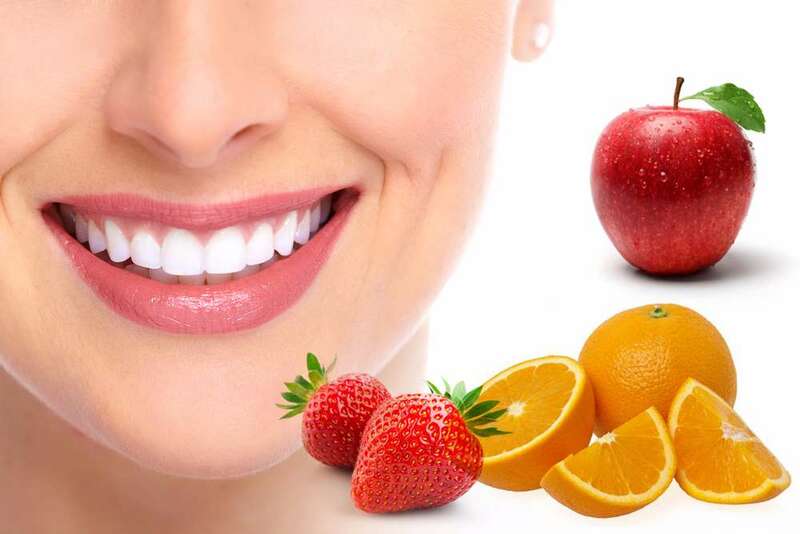 art from that, here are top 7 foods that whiten your teeth naturally and its easily available with you in the house. These fruits may be a dark colour, but they are also packed with an enzyme known as malic acid, which naturally makes teeth whiter. Don’t let the red color fool you. Malic acid, a chief component of strawberries, acts as a natural astringent to remove surface tooth discoloration. No matter how you eat like in salads, desserts, cereal, you’ll be whitening your smile in the process. You can even mash one up and put it on your toothbrush. Just chewing on apples helps scrub your teeth. Apples also have a high concentration of malic acid, which is used in some toothpastes. Malic acid increases saliva, which cleans your teeth and helps remove stains.